Creative digital and technology innovators are invited to take part in a design challenge to create new products for the NHS and wider healthcare sector. The Yorkshire and Humber Digital Health Design Challenge will take place at the Digital Media Centre (DMC) in Barnsley. The initiative will bring designers and healthcare professionals together over two ‘hackathon’ days to explore, develop and devise digital solutions to real-life patient and service delivery needs. The workshops will be held on Thursday March 3rd and Wednesday April 20th and will tackle a selection of patient care challenges identified by local NHS trusts. The NHS trusts involved include Barnsley Hospitals NHS Foundation Trust, Doncaster and Bassetlaw Hospitals NHS Foundation Trust and Sheffield Teaching Hospitals NHS Foundation Trust. The design challenges will be drawn from areas of patient care such as maternity, supporting people with multiple sclerosis, prevention of pressure ulcers, helping patients find their way in hospital, falls and patient safety, dementia care and advanced planning for long-term conditions. 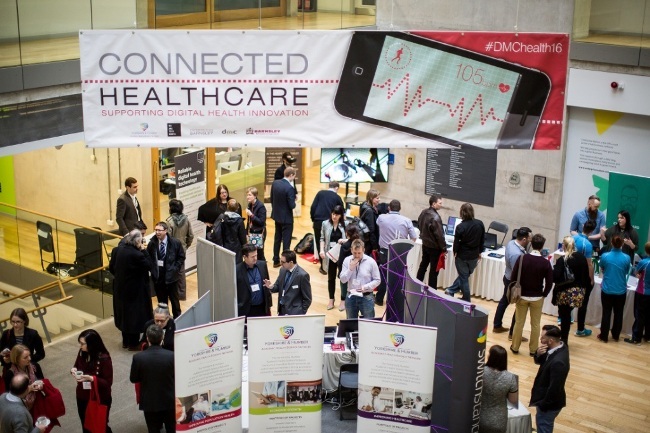 Organised through the Connected Healthcare digital health innovation programme, the Challenge is open to all digital and design entrepreneurs, students and SME agencies across the region. It is free to apply for one of the limited places via an online form. Connected Healthcare has been organised by the DMC, through the Enterprising Barnsley business support programme, in partnership with the Yorkshire & Humber Academic Health Science Network (Y&H AHSN) and Tech North. DMC project director Tracey Johnson said: “This is a fantastic opportunity to bring together healthcare professionals and creative and digital innovators to hot house ideas for technological solutions to real-life health service challenges. Experts in the commercialisation of health technology and intellectual property will be on hand throughout the process to advise participants on the agreed handling of each collaborative project during the process and afterwards. The hackathon event will be facilitated by Victoria Betton of Leeds-based digital health organisation mHabitat. A Connected Healthcare ‘Access to Finance’ event will also follow the Design Challenge in the spring and will focus on possible sources of funding for product development. Challenge participants may be able to pitch their ideas at this event. For more details and to apply to take part in the Yorkshire and Humber Digital Health Design Challenge go to www.barnsleydmc.co.uk The closing date for applications is 5pm on Monday February 15.